Salads are boring right? Just plain old lettuce, cucumber and tomato, plain old boring rabbit food? Wrong! Stop the press! Salads can be awesome and exciting! You don’t believe me do you? 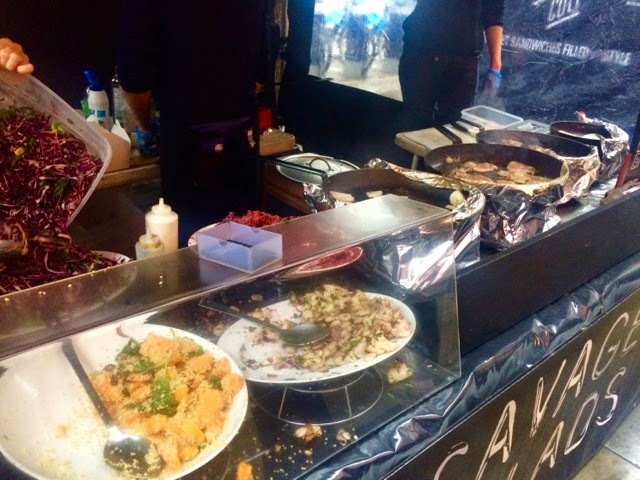 Well get yourselves down to Savage Salads at Berwick Street Market and let me prove you wrong! I’ve been walking past Savage Salads, which is currently perched just around the corner from the market on Broadwick Street due to road works, for weeks becoming more and more intrigued as not only are there always enormous queues, it also smells absolutely incredible. 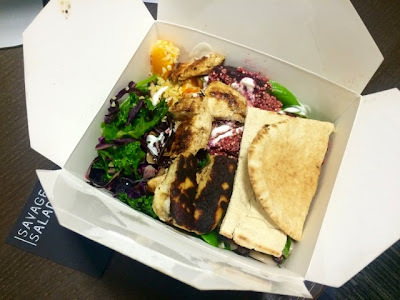 The concept at Savage Salads is simple: you can either have chicken or halloumi (or half and half) and then there’s a selection of four salads that you can choose from or have a bit of all four, a couple of slices of pita bread are thrown into the box, all for a fiver. 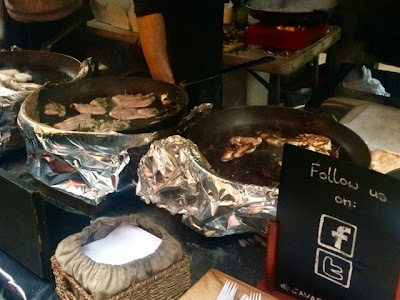 Tender pieces of chicken breast marinated in garlic and rosemary are cooked in front of you fresh to order, as is the halloumi. It’s this that’s responsible for the hard to miss amazing smell wafting down Broadwick Street drawing people in. I opted for both chicken and halloumi and all four of the salads. The salads were: quinoa and roasted beetroot (my favourite of the four), red cabbage with greens and almonds, roasted cauliflower with butter beans and pomegranate seeds and finally butternut squash with cous cous. I also said ‘yes, please!’ to the offer of balsamic and garlic yoghurt drizzled on top. As I said the beetroot was my favourite of the salads but the pomegranate seeds from the cauliflower salad were an unexpected gem! I’m not usually a fan of fruits and sweet things thrown into a salad however it was hard not to love the sharp burst of flavour that came from biting into one of these. The chicken and halloumi were both equally delicious and the fact that they’re fresh from the pan really takes the whole dish up a notch. In this cold weather having a hot freshly cooked element thrown in takes this dish from big box of tasty goodness that makes you feel good to big box of homely warming, comforting tasty goodness that makes you feel good. Most other salads I could buy for my lunch in Soho at the same price consist of 99% leaves, some cucumber and tomato, a mean amount of one or two other vaguely more exciting ingredients and with no or a very small amount of too oily dressing. I’m a firm believer that as a nation we are generally doing salad wrong. It doesn’t have to be plain and it doesn’t have to be dry and limited to such a specific range of ingredients. There is such a huge variety of more exciting, tasty vegetables available in this country I’m at a total loss to understand why, as consumers, we stick to so few. I think what Savage Salads is really doing right is filling a massive gap in the market and doing it for a reasonable price. It doesn’t feel like the cop out healthy option that you finish whilst wishing you’d actually just gone and had a pizza, it’s a decent sized box and I genuinely felt pretty full up afterwards.